What is a Competitive Link Analysis? In simplest terms, it’s a way to find your competitors backlinks and get insight to how/where your competitors and the industry are gaining links. Why Should You Run a Link Analysis? Running a link analysis allows you to find domains that link to your competitors but aren’t linking to your domain, it also could give you a higher chance of finding domains that are relevant to your business for other types of marketing and advertising. The next steps are going to be based on the number of competitors you find to be relevant to your business. For this blog post, we decided to use Ahrefs; (There are other tools such as Moz OSE, SEMRush, MajesticSEO, CognitiveSEO, etc.). 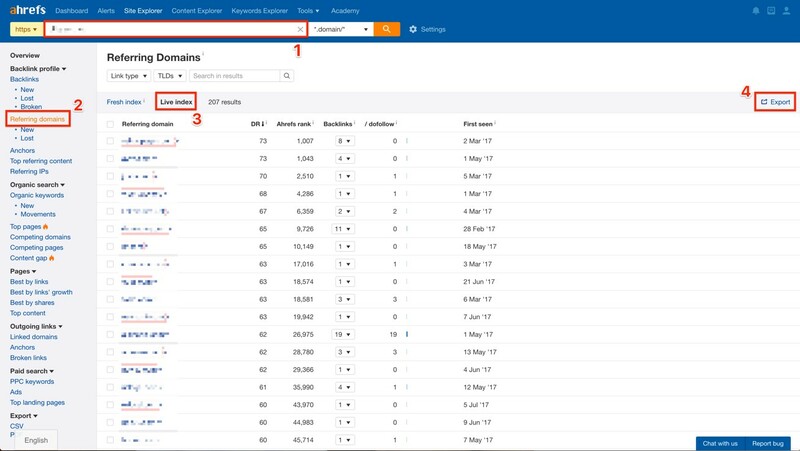 Ahrefs allows you to run a direct link intersect report up to 10 domains. 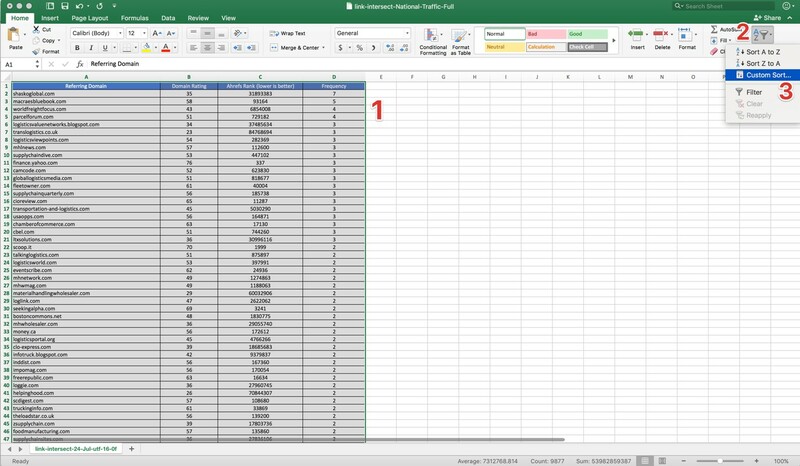 If you gather more than 10 you will have to run a backlink link report for each one of the domains separately and run them through a pivot table to get the same results; which may be overwhelming to those less experienced in Microsoft Excel. Below we will describe how to run it both ways in detail. First, you have to enter your competitors into the Link Intersect tool by going to “Tools” (located in the top navigation bar) -> Link Intersect. Enter the domains and make sure to select “any of the below targets” for your competitors, and then enter your domain under “But doesn’t link to…”. Click “Show Links Opportunities” to run the link analysis. Once you see the report page, go to the top right and click “Export”. Download as a Full Export as a CSV Format file. 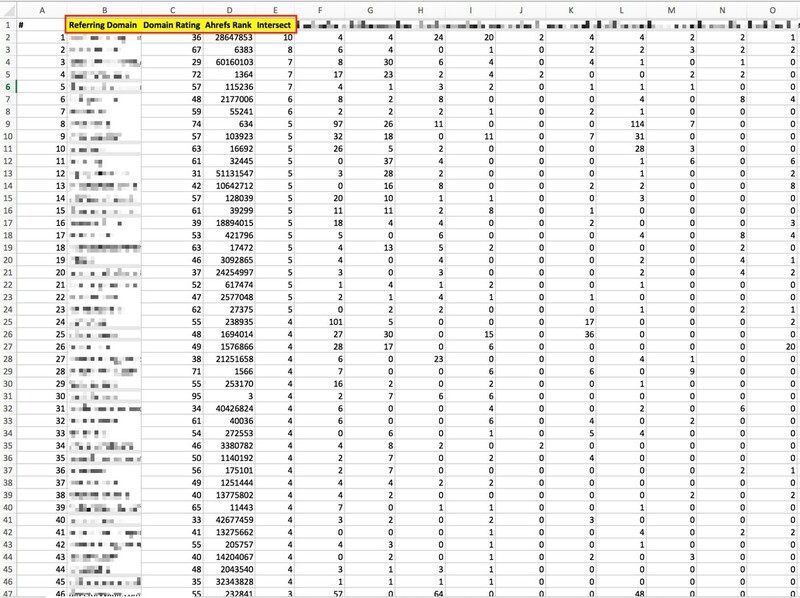 Sort the data by column “Intersects” followed by its “Domain Rating”. To do this go to Sort -> Custom Sort, then enter the data as seen in the photo. This gives us a clear picture of which domains may be easiest to get a link on as well as what type of domains your competition/ industry is linking to. After creating your Excel sheet and filtering out low Domain Authority sites, non-relevant sites and spammy websites you will want to export it to an Outreach Management/ Link Building Platform. Since you are not going to be able to use the Link Intersect tool on Ahrefs for more than 10 competitors, you’ll have to do exactly the same thing the tool does, but manually. We’ll guide you through this process that takes longer, but at least you will be able to get deeper insights and data within your niche (more competitors). In many cases, you may be satisfied simply following the link building footsteps of your top 10 competitors. 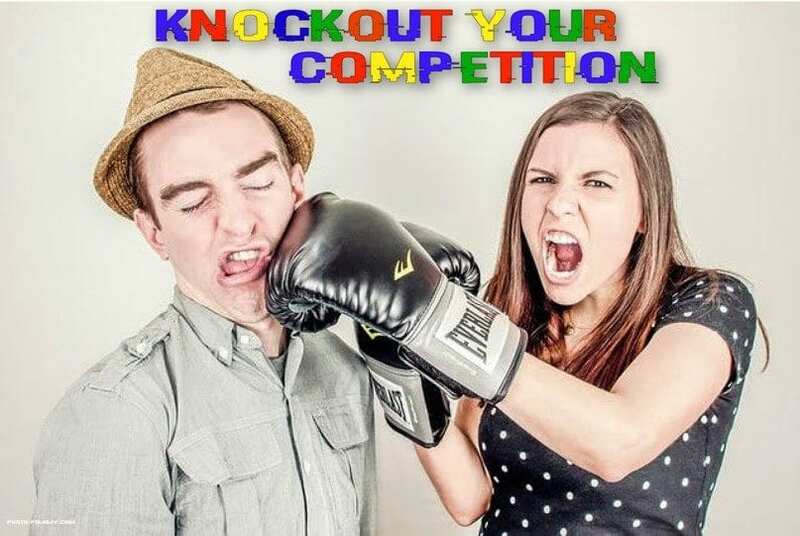 In some cases, you might not even have more than those 10 direct competitors to deal with. 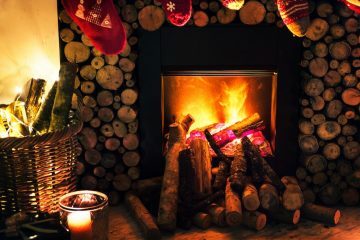 In other niches, 10 is only the very tip of the iceberg, so you will definitely need to do something like this. 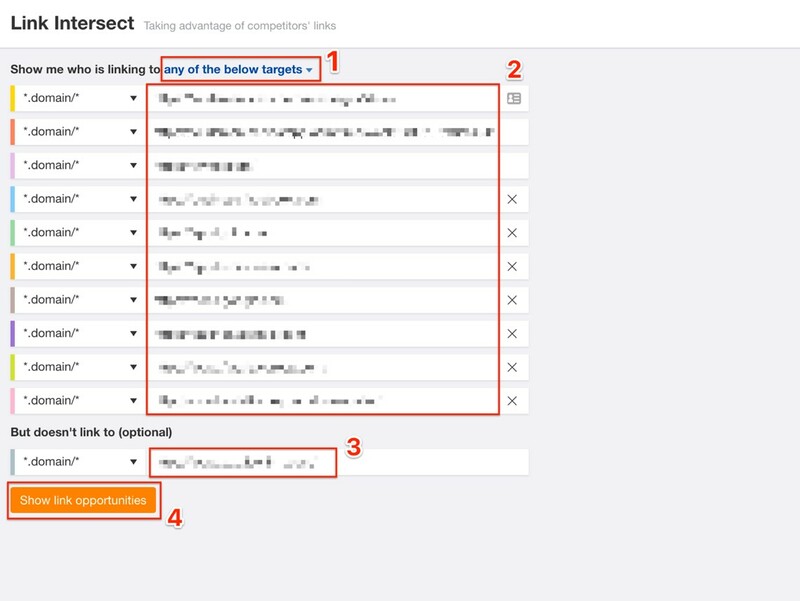 In order to get the referring domains from every single competitor you want to be part of this competitive link analysis research, you will have to take the following steps as displayed in the screenshot below for each one of them. Click the “Export” button and download the .csv file. Here you will create a pivot table with the referring domains from all the competitors you saved from the .csv files during the previous step. 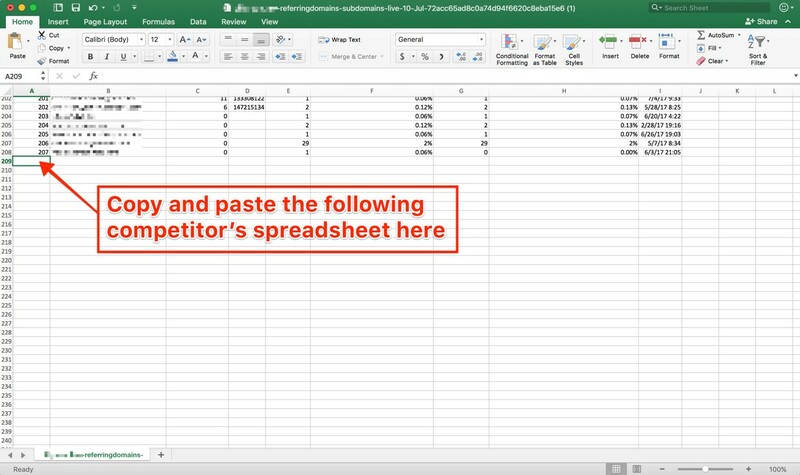 Get them all together in only one spreadsheet first as you can see below – you can make the first competitor’s referring domains spreadsheet as the master file – and copy/paste the next competitor’s after the final row of the previous one. Ok, so now you are probably thinking: “Well, there will be a lot of duplicates if I add every competitors’ referring domains in one single spreadsheet!” And guess what? You are right! That’s the idea though. 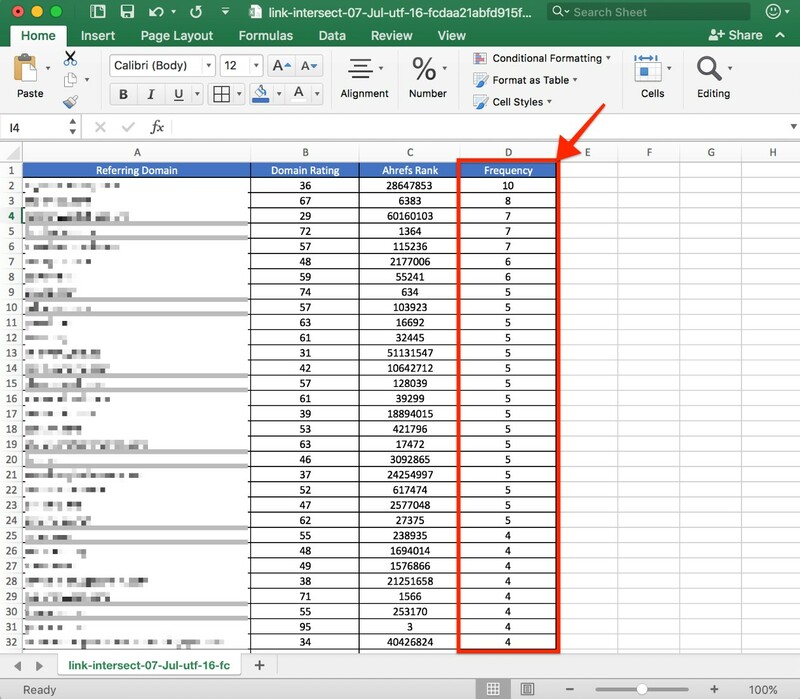 We’ll get them all together in one spreadsheet and then what the pivot table will do is let you know how many times (frequency) each one of those domains shows up. If you have any problems creating a pivot table, click here for a step-by-step guide. After your pivot table is done and you have the frequencies you were looking for, all you need to do now is to copy it and make it an editable spreadsheet again. You can do it by simply copying the pivot table and pasting into a new workbook. This screenshot above represents the new workbook after getting copied from the pivot table. 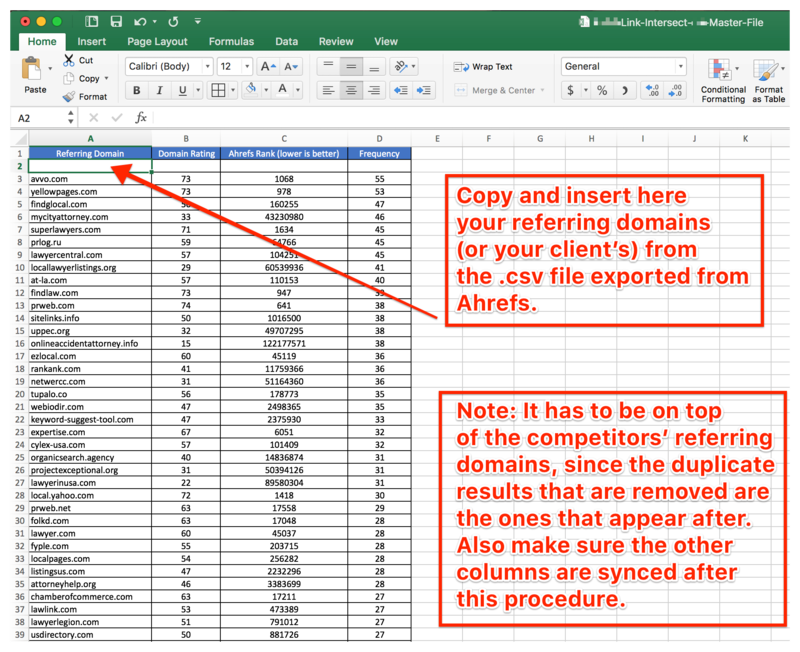 Now it’s time to add your (or your client’s) referring domains spreadsheet – also downloaded from Ahrefs – right below the last row from the new workbook created after being copied from the pivot table. This way you will be able to keep only the referring domains your competitors are getting backlinks from that you don’t have yet, which is exactly what the Link Intersect tool does for you. Remember that it’s extremely important to make sure that the columns are aligned properly, otherwise, the dedupe process (next step) won’t work. And now, all you need to do is to click on “Data” and then “Remove Duplicates” in Excel (screenshot below). Also, make sure to hit “Ctrl + A” (or “command + A” for Macs) to select the whole spreadsheet before going through the dedupe process. Then make sure the dedupe is going to be based on the “Referring Domains” column only – which is the crucial info needed for this. 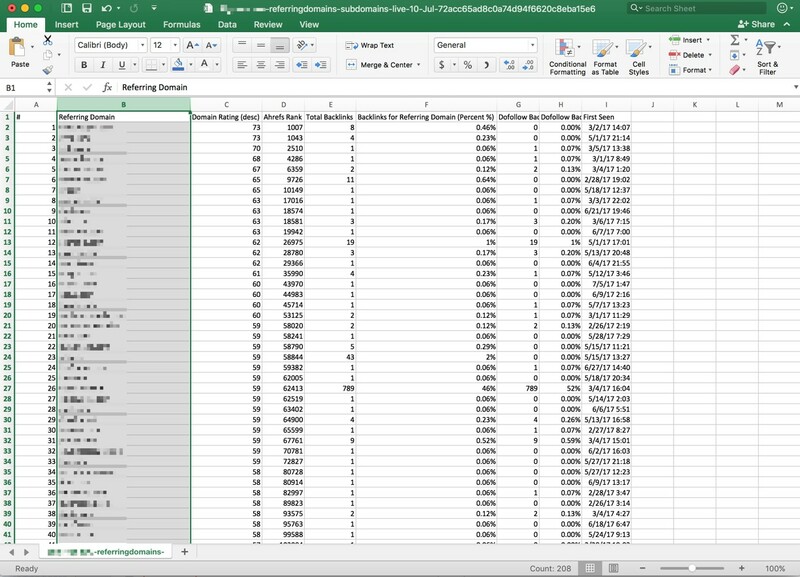 After finishing the dedupe process, it’s time to remove your referring domains that remained in the bottom of the spreadsheet. You will be able to recognize them as they won’t have any number on the “Frequency” column. What this will do is remove the remaining domains that you (or your client) have and the competitors don’t. Otherwise, those would be removed during the dedupe process. This part of the Competitive Link Analysis can be very time consuming since you are going to have to check one website at a time from your spreadsheet, but it’s extremely important though. You don’t want to add the whole spreadsheet as link opportunities to your Outreach Management platform, believe me! 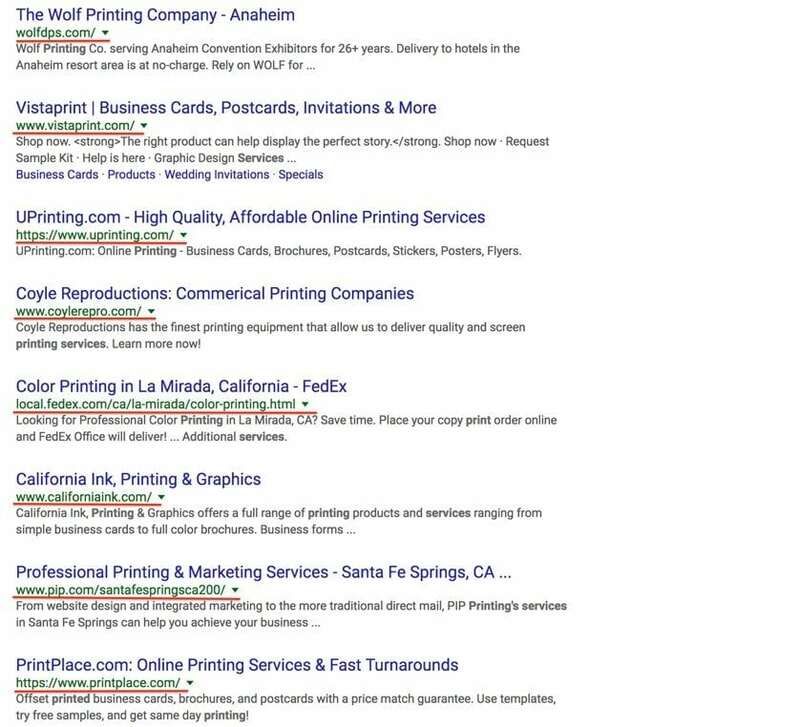 You have no idea (or maybe you do) how many bad and spammy sites your competitors can get links from! And, of course, you want to spend your valuable time with good link opportunities! Remember, the final spreadsheet you have up until this point gives you every single link your competitors have, but you don’t. So, it’s time to clean it up. As a final recommendation, sort your spreadsheet by frequency and then domain rating. This will make your life a lot easier, since you will be examining the domains that most competitors have first and then higher rating or DA. Make sure you select “sort by” frequency first – values largest to smallest – and then by domain rating. In Conclusion, running a competitive link analysis will give you a step-up advantage over your competitors. Whether it is for new outreach strategies or to learn what your competitors are doing. You can use this information to find out what your competitors are doing well or not well, then use this information to do it better than your competitors and avoid where they are making mistakes. Keep in mind there are many other sites that give you the tools to do a competitive link analysis but for this post we used Ahrefs.